High Rollers who dream of being lucky should play this Novomatic slot game! It’s one of Novomatic’s most popular slots reimagined to suit high rollers specifically. Some people are born lucky and others have to play a lucky slot to get what all the fuss is about! This is one of the luckiest slots out there, and Lady Luck is the main character. In this slot game, she’s a blonde bombshell with beads in her hair. In addition to Lady Luck, everything in this game practically drips luck! All of the symbols are lucky in some way or another. Different people believe different things are luck! Some people believe the number 3 is lucky, other people believe the number 8 is lucky. It all depends on your culture! For the Irish, the four-leaf clover is a lucky symbol. For the English, horseshoes are considered to be lucky. In Native American culture, dreamcatchers are lucky. And, in China, people believe that bamboo brings luck! These are just some of the lucky symbols around the world! There are many more. For a dose of luck with a side of slot fun, High Roller Lucky Lady’s Charm Deluxe is just the ticket. This is just like the original version but it’s meant for High Rollers! People you play with bigger bets get bigger wins! High Rollers may also want to give these other Novomatic slots a go: High Roller Book of Ra Deluxe, High Roller Jackpot, Wild West, Shooting Stars Supernova and Jackpot Diamonds. You’ll experience the Lucky Lady’s Charm when the reels stop and you can see three or more of the same symbol! For the charm to be converted into cash, the symbols that match each other must be on the same payline, consecutively from reel 1. For example, for a x3 match win for the ladybug symbol, three ladybugs must land on reels 1, 2 and 3 (one on each reel), on positions that follow a payline. If they land on positions that follow a payline but land on reels 1, 4 and 5, they won’t pay. The same goes for any and all symbols, they must land consecutively on a payline from the left, except the scatter. The scatter and the wild are special symbols. The other symbols are the high cards (9, 10, Jack, Queen, King and Ace), the golden penny and the four-leaf clover, and the ladybug and the horse’s tail charm. Lady Luck offers the biggest cash wins! Lady Luck, the ladybug, the horse tail charm and the 9 will pay out for 2 matches or more. The other symbols will pay wins for 3 matches or more. If you’re feeling extra lucky, when you get a win, instead of collecting it, you can gamble it. 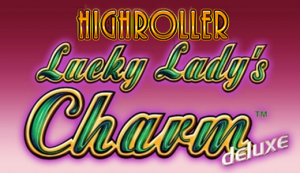 In High Roller Lucky Lady’s Charm Deluxe, you can win Free Lucky Spins! There is one last symbol in High Roller Lucky Lady’s Charm Deluxe that we haven’t yet mentioned. This might just be the best symbol of them all. It’s a pink crystal ball and it will help all of your dreams come true. When you see two crystal ball symbols, you will get a payout. When you see three, four or five, you will receive a payout plus 15 Free Games. This game is popular for its Free Spins. You won’t always trigger the Free Games when you’re playing but, when you do, you’ll feel very lucky indeed! Every single payout you win from the Free Games will me multiplied by 3! Didn’t we already say that three is a lucky number? Well now you better believe it! Get three or more Scatter symbols and win Free Games with a 3x multiplier!